SÃO PAULO, BRAZIL – A little over a month after the Brazilian government announced its was reducing the federal budget, the Rousseff administration says that the February expenditure reduction will not be sufficient to reach this year’s primary surplus target. So they are reducing the budget once more, with the largest cuts once again to be seen in the Ministries of Education, Mines and Energy, and Health. 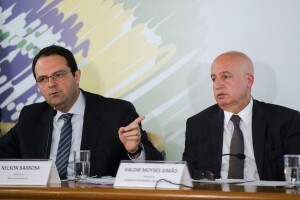 Finance Minister nelson Barbosa and Planning Minister Valdir Simão announced first budget cuts back in February, photo by Marcelo Camargo/Agência Brasil. In February the government announced it was cutting federal spending by R$23.4 billion in relation to the original 2016 budget bill, sent to Congress last year. These latest cuts will reduce the budget by another R$21.2 billion, making the total reduction in expenditures so far R$44.6 billion. The Ministry of Mines and Energy once again will be the hardest hit, having to reduce its spending by more fifty percent, from R$3.53 billion to R$1.382 billion. The original budget for the sector for this year was of R$6.70 billion. Brazil’s Health Ministry currently dealing with the Zika virus health crisis and the increase of the H1N1 virus (swine flu) will be forced to reduce its spending from R$90.35 billion to R$87.98 billion, after decreasing in February by almost R$3 billion its original R$93.3 billion budget. The Education Ministry has been told that it will receive R$4.27 billion less this year, with a now stipulated budget of R$30.2 billion for all its programs. The original budget for the Education Ministry proposed to Congress at the end of last year had been of R$36.6 billion. The Planning Ministry also announced that it was reducing investments in the Growth Acceleration Program (PAC) by an additional R$3.21 billion. In February the program had already suffered cuts of R$4.23 billion, with the federal government now planning to spend R$26.49 billion in PAC projects, which include Minha Casa, Minha Vida.